A holistic place to share thoughts on teaching the art of composition. Life (and composing) Begins at the End of Your Comfort Zone. The past three weeks has flown by. We have experienced two major hurricanes (by the way Virginia Grissom and Laura Grace Chandler are safe in Tampa Florida), started our studios and begun the process of building young musicians and music creators. Those first weeks can be a struggle as we find out how much our students have regressed, try new ways to teach the joy of music and assess how best to move students up and onward. For weeks now, I have received information from some of our best music educators about how to make my studio stellar! Fantastic! and the very best place for my students to learn. Every time I read these wonderful posts, I just get really tired because there are hundreds of great ideas but....limited amounts of time. So how do we push our comfort zone? Let me just share the question I pose to students when a musical task seems overwhelming. How do you eat and elephant? One bite at a time! We break our tasks down into small bites and proceed from there. This is one of the reasons Karen and I chose the Creative Composition Toolbox and Wynn-Anne Rossi as our Composing Pedagog in Residence. Her books are making the whole idea of composing for beginners a little less like eating an elephant in one bite. This past week, my beginners were introduced to the first book in her series. Instructions were very clear and the 6 young beginners were encouraged to give their composition involving the range of the piano (just CDE and FAC up and down the piano in varying configurations) a go. They really took to the process; then things got messy. I won’t go into the mess but let me say, I was the only one who thought it was messy. The kids loved it. They shared their piece with their parents. They wanted to play their piece at lessons. They did forget to bring their ‘Toolbox’ to lessons. It was out of my comfort zone but it was real life to these 6 girls. We meet again today and I am hoping they will share their voice with each other. To another week of good music and music creation. Beginning our new academic year. distilled down much of what was in the book; making relevant those ideas that pertain to musicians as a whole. Just a little something to keep in mind as we build a whole new group of music creators this year. Upload to our Facebook group compositions from your non-traditional composers who have not yet been introduced to Noteflight. Video tutorials made just for those using the Creative Composition Toolbox called Wednesdays with Wynn-Anne. Special ways to help students perform their work. Your instrument’s range or the range of the instruments you are composing for. The damper Pedal or ways to sustain sound. Want to know where to find all levels of the Creative Composition Toolbox? Head to Graner Music in Colorado Springs or give Charlotte Baker a call to place your order. She will have the materials sent right to your studio. After a visit to The Brookline Booksmith, I jumped into my reading program with both feet. The ideas put forth by the first two books on the list, The Genius in All of Us & Grit have been the inspiration for our Colorado Composes with Friends2017-2018 academic year. Angela makes a further case by saying that “we want to believe that Mark Spitz (or any other accomplished person) was born to swim (compose, play, write) in a way that none of us were and none of us could. We don’t want to sit on the pool deck and watch him (her) progress from amateur to expert. We prefer our excellence fully formed. We prefer mystery to mundanity. What Angela was trying to say is that talent (what ever particle of natural gift we were given) is only 1 part of the equation. It takes talent x effort to equal skill. Then as your skill increases and you times it by more effort you equal achievement. As we begin our new academic year, there will be lots of opportunity to take your raw talent and with effort turn that talent into skill. You will be asked to take on board the Japanese saying, “Nana korobi ya oki.” In English the saying goes something like this, “Fall Down Seven, Get Up Eight”. It really means, if you fail, try, try again. You will only accomplish good things if you are willing to work for them. As students have worked on their composition process this past year, we have noticed many good things, but the best outcome has been the growth in composition skills because you practiced the art of music composition. So with that being said, welcome to the 2017-18 Colorado Composes With Friends Project year. Colorado Composes with Friends will begin a new academic year Sept. 4th with the introduction of our theme for the year, Sparking the Creative Genius Within You. Yesterday was our first Colorado Composes meeting for the Jensen Piano Studio. Most of the kids have spent a full year in the project and are very familiar with the composing process. Are they skilled composers? Not really, but they are just babies in the composing process. As we begin this new year of Colorado Composes across the project and from coast to coast (not just in Colorado) our students will be embarking on their own unknown journey. Some of our kids will need extra kinds of encouragement. Some kids will have ideas coming from every direction. Our job is to allow them to experiment because art and science are about the ‘Try-fail, Try-fail, Try-succeed’ process. There will be some frustration but if we can ‘travel through the unknowns with just a destination in mind’ without giving up, we will create some wonderful things. Our work with Adriana Janse van Rensburg’s ‘Outer Space Unit’ in Music Composition, it’s elementary’ allowed us to brain storm a few ideas. Today’s class will use Jill Hanrahan’s composing boxes to help with their creative process. We are on a wonderful journey where we are mixing the creative and analytical. Creativity takes so much courage and so off we go into music creation, ‘the final frontier’. This morning, while working on studio business, I came across this unbelievable short film. It is all about composing, creating, exploration and much more. If you have an iTunes account, you will want to search for this short film. The composers and artists who have lent their creative minds to this project will inspire you. Our teacher workshop in Denver. In spite of the 102 degree heat, we had a wonderful time. When it comes to composing and teaching composition, it is all about,”Beating Fear”. Our Denver workshop was attended by some of Colorado’s best composers and composing teachers. We are excited to let everyone know that teacher subscription is now open. We have our first subscription which now makes Colorado Composes with Friends a project that is literally from coast to coast. When asked if a child would like to participate again in the Colorado Composes Project, a child actually said, and I quote, "Not only yes but a huge yes." The growth we have seen this past year has been tremendous. Over 100 compositions were written. Kids who had never composed wrote an eight bar piece and then a sixteen bar piece and then a 7 page piece for six instruments. In order to become a good composer you have to do what every music teachers suggests to become good at your instrument, Practice. So here is to one of our more prolific composers, Mitchell Galligan. Mitchell has become the "Rock Star" of the project. He is the person all the kids want to hear. It has been his inspiration that has lifted the project from just a bunch of kids composing to a community of composers. Kids from Tampa Florida, Longmont Colorado, Denver area and Colorado Springs have created music that is enjoyable for us to listen and experience. So here is to you, Colorado Composes Project Participants. Applause!!!! Young composers who are planning to join us for year number two. Our young composers have just submitted their pieces for Electronic Keyboard under the direction of Andrew Eales. It is hard to believe but Andrew actually sent personal e-mail to each student who contacted him. He is a very busy man but he made time and we are most grateful. We have just finished the first year for Colorado Composes and are busy as bees getting ready for our second year. You will want to stay tuned and visit the site at least once a week to view updates to the project for next year. Module: Students will be able to sign-up for a module, two modules or an entire year. This will give teachers and students more flexibility in the program. Each module will last about 12 weeks, have two six week topics and two presenters who will teach to either the topic or to a principle that supports composition. The Holistic Composer: Andrew Eales has created a wonderful blog called Pianodao. This website has been our inspiration to invite a presenter to share their journey in the composing process. Topics such as "A time to win and a time to lose" will address how to deal with failure in the composing world. Timothy Brown will lead us to find ways to deal with the competitive process, how to deal with failure and how failing is just another word for learning. Proposed Presenters: Let's just say you will be overwhelmed with our presenters this coming year. We are still in the process of nailing down some of the finest English speaking composers on three continents. You will not want to miss this next year. A huge thank you to our dear mentors. They are the best and have been there every month to give support, suggestions and to communicate. We are most grateful to you! Join us for year number two and you will be amazed at what you will acheive. What we have learned from the project so far. It is hard to believe that we are nearly done with the first year of the Colorado Composes with Friends Project. Just a few facts that are good to keep in mind as we enter our last compositional presentation. We have 37 student participants. Out of those 37 students, at least 29 have composed at least one piece. Twenty-four of the participants have composed 2 or more pieces. Seven of our participants entered the Colorado NFMC Junior Composer Competition. Four of those entrants won or placed at the state level of the competition. Students have composed in 6 different genre of music ranging from lead sheets to multi-instrumental pieces. What I have learned through the project has been invaluable. As a teacher, I felt that workshops and conference talks left me with lots of missing parts when it came to the teaching of composition. Composing is not nearly as hard as teaching others, with so many different learning styles, to begin the creative process for themselves. The project allowed for eight different presenters to share their approachs. This allowed me to glean those principles that could work for my students. It is also very apparent that the students learned something from the project. Here are just a few things I have observed in my own students as they participated in the project. The chance to practice. Composing is not a once a year, one time skill. You really have to practice and as you practice it is just natural that you get better. They have stretched and grown. The Blues is different from creating a lead sheet where the melody must be really good in order for folks to sing along. Creating a nature piece gave some students the chance to work with more than one instrument. When you learn the capability of an instrument different from the piano, you suddenly realize that the piano is a really cool instument. There were moments of heavy thinking and lots of editing. That's how creation works. You save some of your ideas and you discard others. Friends were made. As students listened to and viewed those chosen for the 5 Star Composer Bar, they wanted to comment on those pieces, find ways to emulate that style and bring a composition to the table that was of the same quality. Composing with the project was not a solitary endeavor. They received wonderful suggestions from their mentors. These dedicated musicians wanted each child, in their charge, to succeed. Their comments were clear, loving and full of workable suggestions. Their piano performing skills improved. This was quite the shock. It was not an expected outcome of the project. The students who actively wrote peices were more musical in their own playing of others pieces. They learned that creating allows freedom for their ideas, thoughts and musical soul. For the past few months, our young composers have been learning, building and honing skills of creativity. As a teacher of young minds, it has been interesting to see who has jumped on the creation bandwagon and who, for reasons unknown, are afraid of hearing their own voice. As I watched Martha Hill Duncan explain her composing process, I am reminded of the effort and contemplation that goes into the making of a composition. I once heard a colleague state that a students could just sit at the piano for a minute or two and make something up that could be entered into a composing competition. The process was easy and took just an instant. The questions was, "Why should we offer the composer as much as the performer?" Our society is very focused on the end product. Phrases such as, "What is the bottomline?" or "What is the end product?" seem to focus not on the process but the final offering. With such an emphasis on what happens in the end, we bypass the most important and critical thing. What is happening in the process? What is being learned during the moments of contemplation, evaluation and construction? In short, the means should be as important as the end. Students this month will be asked to dig a little deeper into their storehouse of memories and thoughts. They will be asked to write a piece that adds words to music. What are we grateful for? How can I portray my feelings? How can I share these thoughts through music? Watching Martha's video instruction brought to mind all the "finding" composers do; finding a meter, finding a melody, finding just the right harmony. Then, when all is perfectly in order, trying to find a performer for those of us who can't sing. Yes, this is the month for giving thanks. Thank you to all who have jumped on this project and are sharing the joy of composition with students, family and friends. In this case of composing, the means truly justify the end. Feeling overwhelmed yet? To be honest, as the Colorado Composes Project began, I was racing to get my own studio up and running for the academic year having more than one panic attack. I wondered what we were doing even trying to add one more thing to our plates. The thought crossed my mind daily, "If I am feeling overwhelmed, then our teacher participants must be feeling the heat as well." So...after a few Zen moments (heavy breathing), some encouragement from friends and a moment or two to re-evaluate, I took the advice of a colleague in Florida. Just progress INCH BY INCH. My plan INCH BY INCH might not match your plan but if it works for you, do it! First I made a plan of how I would implement the program in my own studio. My plan will be as unique to my studio needs as will your plan. I advertised to the students and parents in the studio. They can't know what they will be missing if they don't know what they are missing. I needed to share the project to see if parents were on board. Everyone, with the exception of bare-bones beginners were included in the advertising process. I was amazed at the response from parents. I decided to introduce or reinforce a new improvisational element for 5 minutes at each private lesson. Time spent at 88CreativeKeys in Denver was invaluable in giving tools to introduce this aspect of creativity in the studio. In group theory class, we will work on round robin call and response type of extemporization. Some ideas for this lesson idea are taken from an old book published by Trinity College in the UK. (See resource below.) This way, improvisation is part of the creative process. I will use my Clavinova! I have this wonderful device in my studio (as a matter of fact, I have two) where students can record an idea and see the idea realized in the score function of the Clavinova. They quickly realize they will have to do a little work on their composition in the notation software as the Clavinova saves the idea just as you lay it down. But at least the pitches and a general form are their for students to pick through. For those with Clavinova experience, this will be a great resource for you. Allow students to work through the process INCH BY INCH. This project is not a competition but a project to build even the most novice composer's skills. It was easy to get frustrated when a student seems to have trouble with a concept as one of mine was having last week. It was providential that I had read a wonderful article in the NAFME August 2015 edition of Teaching Music, by Debbie Galante Block on pg 56 talking about Accentuating the Positive when teaching composition to students. "When teaching composition, a music educator needs to be flexible. 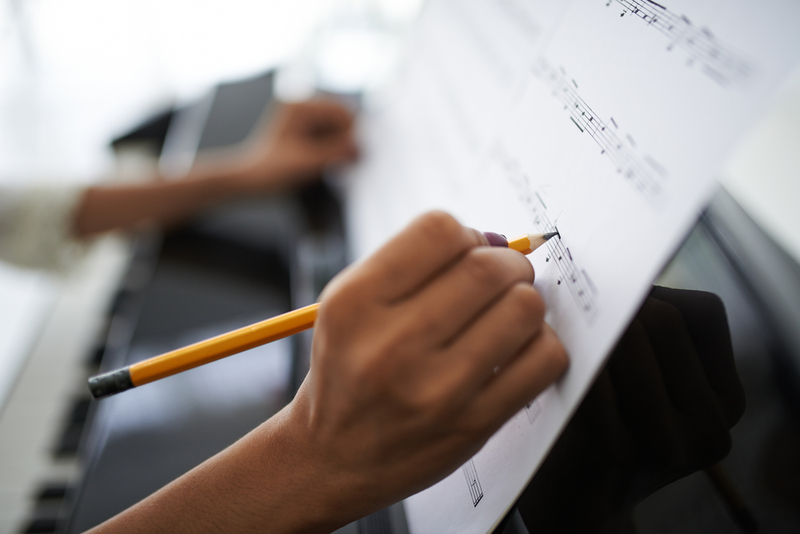 After a concept is taught, a student composer may not completely and immediately understand it. This may take a while-perhaps a year or two. "Give them some time and they will get it. There is no immediate gratification in comping for the teacher or the student." The whole reason for the project is to teach the process. In the 10 months of working in the creative realm it is our hope that at least a few of our students will get it and we will have planted a seed. Until then make a plan and then progress, INCH BY INCH. Noteflight Linking Teachers & Students together using this powerful on-line notation system. On-Line Tutorial Classrooms Led by Nationally recognized composers. Monthly Themed "Imagination Spark Plugs"
Mentors to assist with the creative process. We are building a community of composers and teachers from across Colorado, the West and beyond. Join us in this creative journey.